Let's party like it's the mother-f*cking 1930's! At least, that's what I thought to myself when I first set my ears to Caravan Palace as they dropped an EP towards the end of last year. Trawling through their back catalogue I was delighted to find that, since releasing their fantastic debut LP back in 2008, this Parisian troupe has been fleshing out swing music with generous doses of bass and, I'm struggling for a better word here I assure you, mojo. The result is something quite unlike anything I've heard before, but at the same time it may just be the most invigorating and electrifying styles of music out there. Singles "Rock It For Me," "Clash" and "Panic" from their new LP, Panic, offer much the same in terms of care-free, energetic groove along with exploring the potential of their electronic muscle more thoroughly. "Clash" especially, is a brilliantly clustered sprint of trumpet samples and warm, throbbing bass. It's a clash of conflicting styles that, for some reason, simply clicks; ending up as the kind of track you can't help but move around to, although I'd be very surprised to hear it in a club. 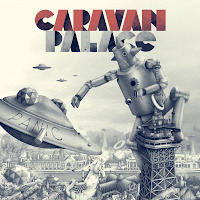 Caravan Palace do seem to have a problem with fleshing out full albums, but for the two they're released so far the highlights alone are worth the effort of acquiring them. Their inconsistency prevents them from really making much of an impact, sadly, yet at least for now they're helping to make music a lot more interesting.